Chevrolet will offer Class 4 and 5 versions of its Silverado for commercial users in fields such as construction, utility services, and first responders, the company announced at the Texas Auto Show. Chevrolet will initially offer 4500 and 5500 Silverado medium-duty trucks as chassis cabs when the trucks go on sale in 2018. The company will release additional details about the vehicles later this year. “The focus is really on commercial truck users,” said Sandor Piszar, director of Chevrolet Truck marketing. Both the Silverado 4500 and 5500 will be available in regular and crew-cab models, with 4x2 and 4x4 capability and a wide range of GVWRs and wheelbases, according to the automaker. The trucks will be available with optional OnStar with 4G LTE connectivity provided by AT&T. All Silverado 4500 and 5500 models will be powered by a Duramax diesel engine and Allison transmission, Chevrolet said in a release. The move comes as Chevrolet is expanding its commercial truck lineup. Earlier this year the company announced it will offer a class 6 Low-Cab Forward model. The company is also developing a medium-duty straight truck in a partnership with Navistar. DALLAS — Today at the State Fair of Texas, Chevrolet confirmed that its all-new Class 4 and 5 trucks launching in late 2018 will be branded Silverado. The announcement came during Chevrolet’s Truck Centennial event, which kicked off a 100-day celebration of the first century of Chevrolet pickups. “The first Chevy truck was built in 1918 for small business owners, and we have been expanding the market ever since because customers want specialized trucks that can tow and haul with confidence,” said Sandor Piszar, director of Marketing and Advertising for Chevrolet Trucks. In the last three years alone, Chevrolet has revitalized the midsize pickup segment with the Colorado, launched a new range of Low Cab Forward trucks and introduced a completely redesigned 6.6-liter Duramax diesel for heavy-duty pickups. John Schwegman, U.S. director of Commercial Product, said Chevrolet’s growth in the commercial market has moved in lockstep with the expansion of the brand’s truck portfolio. Commercial volume is up by 48 percent since 2013 and domestic segment share has grown year-over-year for the past 13 consecutive months. Both the Silverado 4500 and 5500 will be available in Regular and Crew Cab models, with 4x2 and 4x4 capability and a wide range of GVWRs and wheelbases. 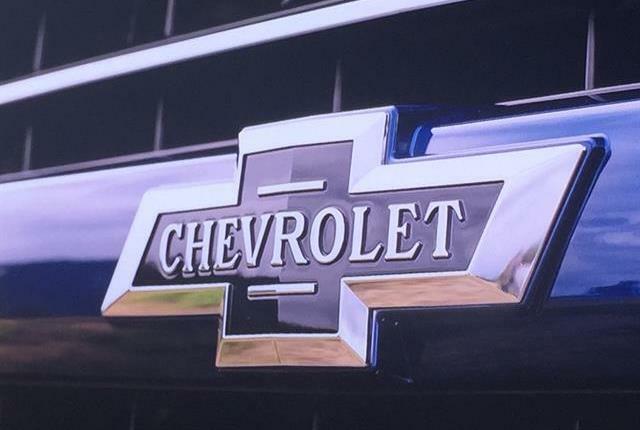 Chevrolet will also offer these trucks with optional OnStar with 4G LTE connectivity provided by AT&T, which fleet management companies are embracing to help improve safety and productivity. All Silverado 4500 and 5500 models will be powered by a Duramax diesel engine and Allison transmission, a legendary combination that has powered about two million trucks. Allison Transmission, based in Indianapolis, is the largest designer, developer, manufacturer and distributor of medium- and heavy-duty fully automatic transmissions. Their designs have been used in a variety of applications, including construction, fire, distribution, bus, motorhomes, defense, energy and refuse. They have helped drive Chevrolet’s hardest-working trucks since the 1950s. The first Duramax diesel engines were introduced in Chevrolet and GMC trucks in 2001, and since then have accumulated more than 100 billion miles of real-world experience. Full technical specifications for the new Silverado 4500/5500 will be released close to launch. "The company is also developing a medium duty straight truck in a partnership with Navistar". Is that in addition to the 6500 XD Isuzu based LCF and the chevy/International class 4/5? I heard rumors that GM might partner with Navistar on the DuraStar replacement. This week at the Texas State Fair, Chevrolet said it is launching new Class 4 and 5 trucks "late next year" that will be branded Silverado. The announcement came as part of Chevy's Centennial Truck event celebrating a century of Chevrolet pickups. Chevy pointed to its truck activity over the last three years, including the introduction of a redesigned 6.6L Duramax diesel for heavy-duty pickups. The forthcoming Silverado 4500 and 5500 models will all be powered by a Duramax diesel engine and have an Allison automatic transmission. Based in Indianapolis, Allison is the largest manufacturer of medium- and heavy-duty fully automatic transmissions that have been used in applications including construction, fire, distribution, defense, energy and refuse trucks. Allison transmissions have also been found in Chevy trucks since the 1950s. "The Silverado 4500 and 5500 will stand out because we've designed the trucks around how customers work," said John Schwegman, U.S. director of commercial product for Chevrolet. "They will be powerful, highly maneuverable and among the easiest trucks on the market to upfit with specialized bodies such as dump bodies, rollbacks, freight boxes and more." Both the Silverado 4500 and 5500 will be available in Regular and Crew Cab models, with 4x2 and 4x4 capability and a range of gross vehicle weight ratings and wheelbases. 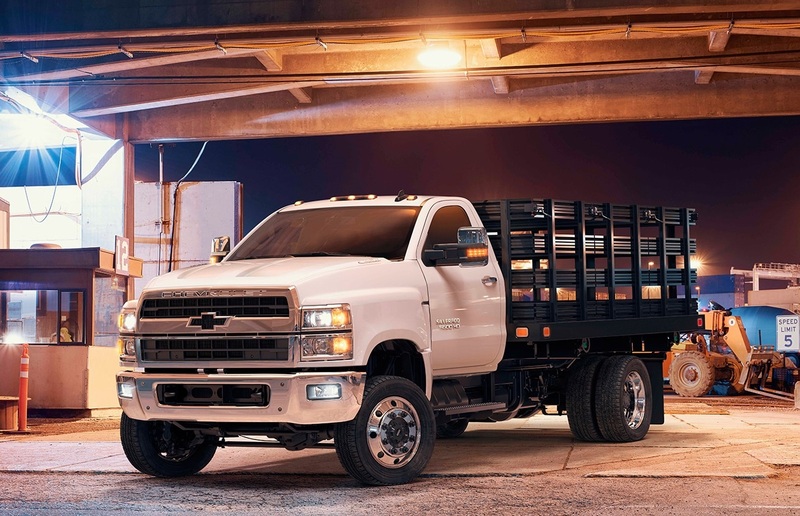 The trucks will be offered with optional OnStar with 4G LTE connectivity provided by AT&T, which Chevrolet noted fleet management companies are embracing to help improve safety and productivity. Chevrolet noted it would release full technical specs for the new Silverado 4500 and 5500 "close to launch." The OEM also said its commercial sales are up by 48% since 2013, and domestic segment share has grown year-over-year for the past 13 consecutive months. "We are earning new business because we have more solutions to help businesses grow," Schwegman said. My bet is just bad reporting. The Chevy badged Isuzu cab over is a class 6. But the new trucks designed jointly with Navistar are in fact class 4 and 5. That looks like the International version, based on the grill design. I wonder what the GVW will max out at. The old Kodiak 5500 went to 26,000#'s. While I wished they built more of it themselves, GM is developing quite a wide product range! Heard yesterday that the diesel Equinox is finally available in America, and gets mid 30s MPG even with 4WD. It ain't a serious off roader being a small car on tippy-toes and it's 1500 pound tow rating is low, but it's MPG beats the gas powered competition by a long shot. The diesel Equinox is supposed to get 28mpg city, 38mpg highway and 32mpg combined. In comparison, the 2018 CRV with the new fuel-sipping 1.5T gets 27mpg city, 33mpg highway and 29mpg combined, and you know its a far better designed SUV with legendary resale value. These MPG comparisons are both AWD models. Note city mpg is virtually the same. In global markets, Honda has offered the CRV with their 160 horsepower 1.6-liter i-DTEC diesel engine paired with a ZF 9-speed transmission. Agreed, but as usual, we Americans can't have the nice stuff, and get stuck with limited diesel options. Car & Driver is known for usually getting worse MPG than the EPA ratings, but in their test they beat the EPA rating by a bit... Sorta reminiscent of the VW diesels. Should be interesting how both crossovers do in Consumer Report's tests, as they use they same course for every vehicle so their results are repeatable and comparable. Class 5 19,500. My bet is Navistar would not have an interest in them getting into class 6 and 7. As for Ford, time for them to come up with a tilt hood for 450-550. When I look under the hood of a Power Stroke 450/550 I say..."sorry for the guy who has to work on this"
Based on what I have seen so far, I think the new GM/Nav JV truck could probably go to class 6. I think the Chevy dealers would like to see that, they could pick up a lot of those basic class 6 sales. I don't see any need for Chevy to get into anything larger. 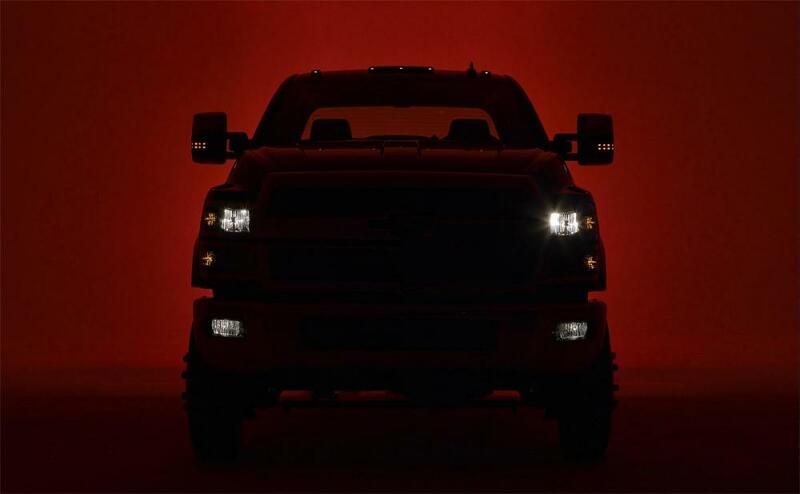 DETROIT -- General Motors will reveal its new Chevrolet Silverado medium-duty pickups in March at the Work Truck Show. The automaker, nearly a decade after abandoning the segment during its 2009 bankruptcy, confirmed in September that it planned to begin selling 4500 and 5500 chassis-cab versions of its Silverado pickup in late 2018. The trucks, which the company has said were built from the ground up and are not variants of existing trucks, are aimed at fleet and commercial buyers and can be upfitted with work-specific beds and boxes. GM said the Silverado 4500 and 5500 will be offered in regular and crew cab varieties, as 4x2s or 4x4s, and with a range of weight ratings and wheelbases. They will be powered by a Duramax diesel engine and Allison transmission, a combination it has used on about 2 million trucks. "The Silverado 4500HD/5500HD trucks are the flagship of our full-line commercial truck portfolio and we've designed them to be among the best in the industry in maneuverability, serviceability, visibility, quietness and comfort, diesel fuel economy and more," said Ed Peper, U.S. vice president of GM Fleet, in a statement. The trucks are expected to go into production in Springfield, Ohio, in late 2018, according to GM. The automaker partnered with Navistar International Corp. to develop and produce the trucks. Additional technical specifications for the Silverado 4500HD/5500HD are expected to be released at the reveal. The Work Truck Show, scheduled from March 6-9 in Indianapolis, is North America's largest work truck event. More than 11,000 public and private truck fleet operators, dealers and equipment distributors are expected to attend this year's show, according to GM. DETROIT — General Motors plans to expand its dealer network for medium-duty commercial vehicles this year from 240 to about 400 with the introduction of Chevy Silverado 4500HD and 5500HD trucks. Ed Peper, GM U.S. vice president of fleet and commercial sales, said the Class 4 and Class 5 chassis cab trucks should "be a good return on investment" for dealers who are committed to commercial sales. "Our dealers really wanted us to get back into that segment," he told Automotive News at the auto show here. The expected dealer levels, he said, would be close to the 450 stores that sold the vehicles before GM exited the segment during the company's 2009 bankruptcy. GM previously had a 25 to 30 percent share of the Class 4 and Class 5 market, which Peper said it plans to regain eventually with the new vehicles. "We saw a big opportunity," he said, adding that GM forecasts three adjacent sales of other vehicles with each medium-duty truck sold. GM plans to open dealer registration to sell the trucks during the first quarter. Requirements include training for sales and service staff on commercial vehicles as well as parts and other specifications such as service door heights and lifts to accommodate the trucks. GM estimates the cost to meet the requirements at $100,000 to $200,000. However, John Schwegman, GM's U.S. director of commercial product and medium duty, said, "Most dealers have many of the facility requirements already." Incremental training and parts could cost just $10,000 to $15,000 for those dealers, he said. "This business is not for someone who wants to dabble," Schwegman said. "If you're not committed to the commercial business, it probably doesn't make sense." Unlike a decade ago, GM does not plan to sell a medium-duty GMC truck, according to execs. "Chevy is the mega-brand. ... They've got to carry the load with commercial," Peper said. Duncan Aldred, vice president of global Buick and GMC, said the trucks would have "fit nicely" with GMC's "Professional Grade" motto, but fleet sales fit better under Chevrolet. In an interview, he said GM figured there wasn't enough volume in the segment to support entries under two brands. GM partnered with Navistar International Corp. to develop and produce the trucks in Springfield, Ohio. It is scheduled to unveil the vehicles in March at the Work Truck Show in Indianapolis. INDIANAPOLIS -- General Motors' new Chevrolet Silverado medium-duty truck will compete in more segments than initially expected, a strategy coinciding with the automaker's plan to expand and improve its commercial dealership network. 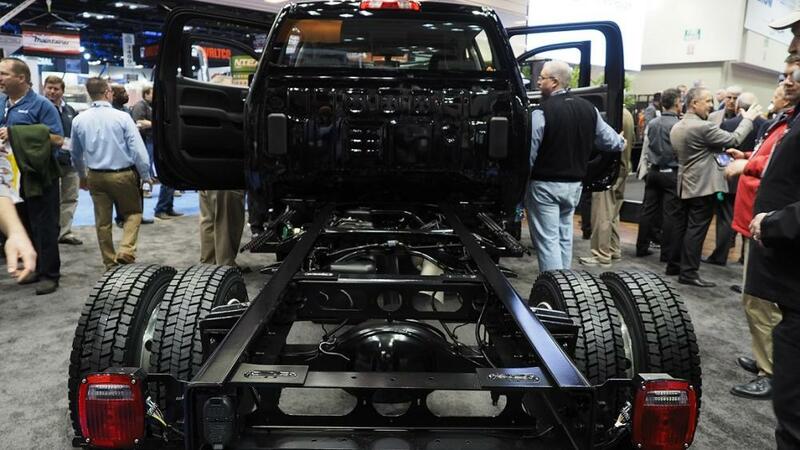 The automaker, when unveiling the vehicle at the Work Truck Show here Wednesday, said it will compete in Class 6 chassis cab trucks in addition to Class 4 and 5, which were previously announced. The addition helps expand GM's reach and differentiate it from competitors such as Ford Motor Co. and Fiat Chrysler Automobiles, according to executives. "This will be the biggest thing we've ever done for commercial," Ed Peper, U.S. vice president of GM Fleet, told Automotive News on the sidelines of the show. "I think it's a real inflection point in our business. This just says a lot about the support from our leadership and the resources that we're getting to continue to grow this business." Medium-duty trucks range from Class 4 through Class 6 based on gross vehicle weight ratings, which is the maximum operating weight/mass of a vehicle. The new Silverado has a max of 22,900 pounds, which reaches into the middle of the Class 6 trucks, where Ram does not compete, and Ford has a truck but on a different frame than its other medium-duties. "It's a different proposition in the market than what Ford and Ram have," said John Schwegman, GM's U.S. director of commercial product and medium duty. The trucks, which the company has said were built from the ground up and are not variants of existing trucks, are aimed at fleet and commercial buyers and can be upfitted with work-specific beds and boxes for work such as landscaping, emergency services, refrigeration and towing. GM expects to eventually gain upward of a 25 to 30 percent share of the medium-duty truck segment, which would equal its level prior to exiting the segment during the company's 2009 bankruptcy. "We're going to have to conquest largely from Ford, a little bit from [Ram]," Peper said. More important than the sales of the medium-duty segment is the adjacent sales, according to Peper. He said, "For every one of these trucks we sell, we think we're going to sell a van, we're going to sell a pickup and one of something else." The adjacent sales are expected to expand past vehicles to other business segments such as GM Financial, parts and accessories and OnStar, which offers a fleet service with tracking and diagnostic services called Commercial Link. The adjacent sales are a main draw for Chevy dealers. However, Schwegman said the company is being "very blunt" in letting dealers know they must be committed to their commercial business to be successful. "It's bad for the dealer if they invest in something and aren't ready for it and it's bad for our customers if they have a bad experience -- they get specked into the wrong truck; they have a service experience; a lack of knowledgeable salesperson," he said. "The best for everyone is to be a commercially-focused dealer." GM last week opened enrollment to become a commercial dealer. GM expects to expand its dealer network for medium-duty commercial vehicles, including those produced through a partnership with Isuzu, this year from 240 to about 400 with the introduction of the Chevy Silverado 4500HD, 5500HD and 6500HD. Requirements to become a commercial dealer include training for sales and service staff on commercial vehicles as well as parts and other specifications such as service door heights and lifts to accommodate the trucks. GM estimates the cost to meet the requirements at $100,000 to $200,000. However, Schwegman previously said many of the dealers already have many of the facility requirements. Incremental training and parts could cost just run $10,000 to $15,000 for those dealers, he said. The medium-duty Silverado trucks, like their light-duty counterparts, feature a mixed-use strategy that includes aluminum, high-strength steel and other materials. They also feature several exterior design characteristics of the current light-duty Silverado. On the interior, the commercial trucks also feature some of the same comfort creatures of the light-duty Silverado on the interior. Some of them include USB chargers, quieter cabins and a built-in 4G LTE Wi-Fi hotspot. The trucks are designed to support wireless cellphone charging and Bluetooth, along with support for Apple CarPlay and Android Auto. They will be available in two-wheel drive and four-wheel drive and will be powered by a 6.6-liter Duramax diesel engine with 350 hp and 700 pound-feet of torque and Allison transmissions with a Power Take Off option. Unlike a decade ago, GM has no plans to sell a medium-duty GMC truck, according to execs. GM did not announce pricing, however it's expected to be $40,000-$60,000. That does not include upfitting charges for specific needs that can cost several times more than the chassis cab. GM partnered with Navistar International Corp. to develop and produce the trucks in Springfield, Ohio. Production is expected to begin in late 2018. Order guides will be available in the spring and exact pricing will be announced this summer. With Hino and Chevy moving "upmarket", Ford better up their game! It goes to class 6. Reminds me a lot of the TopKick/Kodiak 4500/5500 and TerraStar, more of a downrated class 6 than a beefed up class 3. For sure. If I were a Ford dealer tonight I would be raising holy hell within the dealer organization. Medium is growing thanks to changing distribution patterns as well as the need to maximize under 26,000 gvw to avoid the CDL issue and doesn't look like the are doing anything but continuing to piss away market share. Chevrolet revealed its first-ever Silverado Class 4, 5 and 6 chassis cab trucks today at NTEA The Work Truck Show – three supremely capable conventional cab models will be the most customer-focused trucks of any major competitor. 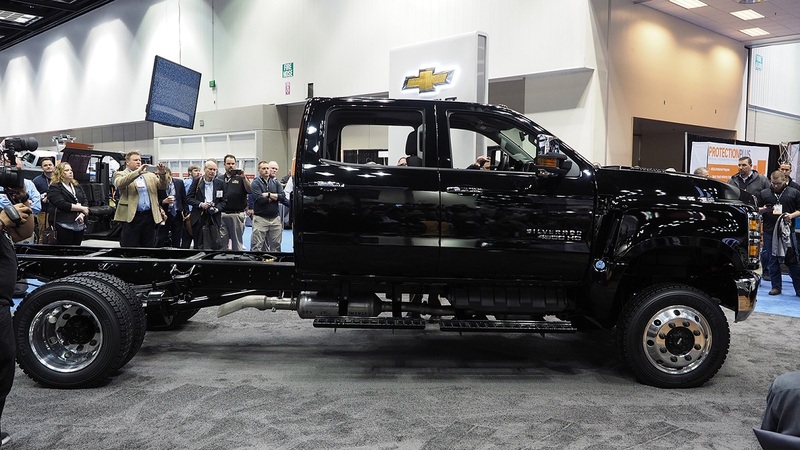 INDIANAPOLIS —Chevrolet revealed its first-ever Silverado Class 4, 5 and 6 chassis cab trucks today at NTEA The Work Truck Show – three supremely capable conventional cab models will be the most customer-focused trucks of any major competitor. The input of fleet managers, truck drivers, upfitters, technicians and Chevrolet dealers drove the development of the new Silverados. Cost and complexity of upfits: Frames that rust; rivets, brackets and fluid lines that interfere with body mounting. A factory-painted frame with one-piece frame rails, smooth, unobstructed top sections, and through-the-frame fuel fill lines. Frame compromises: Frame rails that are too short behind the rear axle to accommodate longer cargo boxes without extensions and reinforcements. 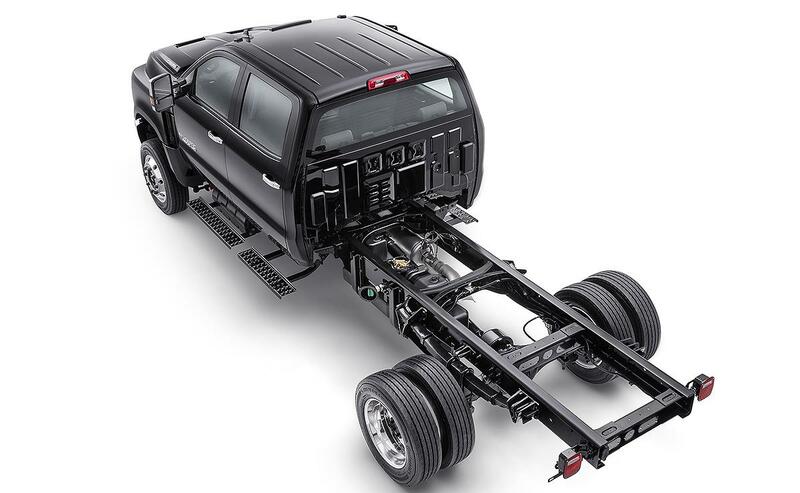 Seven Cab-to-Axle (CA) options ranging from 60 to 162-inches, along with five unique axle-to-back-of-frame (AF) lengths sized in 8-inch increments. Service obstacles: Hood designs that force technicians to use ladders or remove vehicle components to access under-hood components for maintenance and repair. A lightweight, front-hinged “clamshell” hood that, combined with a 50-degree wheel cut, allows easy “walk up” access to under-hood components. Difficult to drive: Poor downward perspective for the driver, along with poor low-speed maneuverability due to narrow wheel cuts, and wide turning radiuses. A precisely crafted and contoured hood optimizes the driver’s perspective of the road. Maneuverability is excellent thanks to up to 50-degree wheel cuts. Noise, Vibration and Harshness: The need to retrofit aftermarket air suspensions to improve ride; loud, uncomfortable cabins. An available, factory-installed rear air suspension, not on Ford and Ram; triple-sealed, inset doors to help reduce wind and road noise; huck bolts used throughout the frame for superior clamping force. DEF tank placement: Poorly-placed and marked diesel exhaust fluid (DEF) tanks that can lead to refueling errors. The DEF tank is conveniently located on the passenger side of the truck – the opposite side of the fuel fill. The Silverado will be available in 2WD and 4WD and will be powered by a 6.6-liter Duramax diesel engine with 350 horsepower and 700 lb.-ft. of torque and Allison transmissions with a Power Take Off (PTO) option. “When you consider all of the flexibility, capability and durability we have engineered into the Silverado, along with the proven power of Allison transmissions and the Duramax diesel engine, we have a medium duty truck line that will appeal to both Chevrolet loyalists and competitive owners alike,” said Schwegman. The Silverado will also be the most connected commercial truck available, thanks to options that include OnStar and Commercial Link, a built-in 4GLTE Wi-Fi hotspot (paid data plan required), wireless cellphone charging, Bluetooth and support for Apple CarPlay and Android Auto. Production of the new Silverado begins in late 2018. Order guides will be available this spring and pricing will be announced this summer. More than 400 commercially-focused Chevrolet dealers are expected to carry the new Silverado line. The launch of the All-New Silverados will build on the momentum Chevrolet and GM Fleet have been building over several years. “Chevrolet’s return to the conventional cab medium duty segment is part of a multi-year strategy to earn the business and loyalty of Commercial and Government customers by expanding into new product segments, delivering innovative business solutions, superior value and an exceptional customer experience,” Peper said. In 2017, GM Fleet delivered nearly 300,000 units to Commercial and Government customers – the most since 2008 – and gained almost 1.4 percentage points of market share. Chevrolet’s three-truck pickup strategy, built around the Colorado mid-size pickup and the Silverado ½-ton and 1-ton models, has made General Motors the leader in pickup deliveries for four consecutive years. New dedicated Commercial and Government products, including the Colorado box-delete and Low Cab Forward, have helped turn the brand into a “one stop shop” for fleet managers and small businesses. Chevrolet has been the broadest portfolio of B20-capable diesel-powered cars, crossovers and trucks in the industry, including the Chevrolet Cruze, Equinox, Silverado 2500HD and 3500HD, Express, Low Cab Forward – and now the new Silverado in class 4,5 and 6 configurations. A very strategic and disciplined approach to the daily rental market helps to support resale values. “It’s a fact: The more choices we offer truck customers, the more we drive sales across our entire portfolio. That’s because brand and dealer loyalty run deep in this business,” Peper said. Founded in 1911 in Detroit, Chevrolet is one of the world's largest car brands, doing business in more than 100 countries and selling more than 4.0 million cars and trucks a year. Chevrolet provides customers with fuel-efficient vehicles that feature engaging performance, design that makes the heartbeat, passive and active safety features and easy-to-use technology, all at a value. More information on Chevrolet models can be found at www.chevrolet.com. 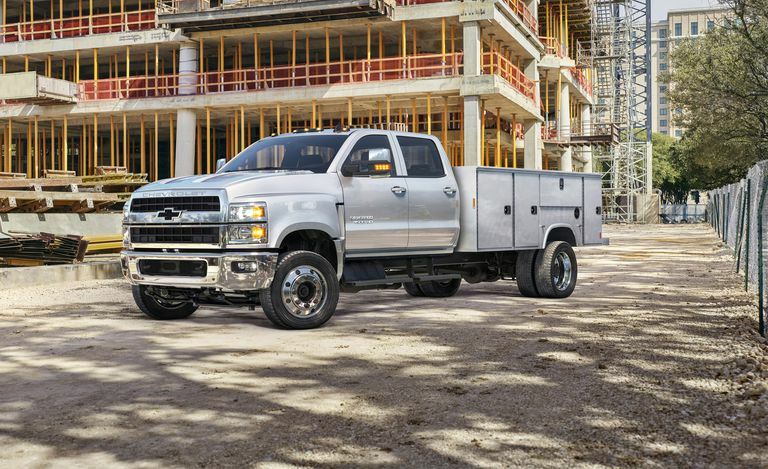 Chevrolet has unveiled three Silverado HD chassis cab trucks — the 4500HD, 5500HD, and 6500HD — that expand its commercial lineup and give Chevrolet a greater weight range of vehicles for fleet purchasers. Chevrolet first showed the vehicles today at the Work Truck Show in Indianapolis. "We see a great opportunity for us with this truck," Ed Peper, U.S. vice president of GM Fleet, told Work Truck. "In the six years I've been with General Motors Fleet, this is the single biggest launch we've had happen in our space. This has been a hole in our commercial portfolio, and we are excited to re-enter the market moving all the way up to Class 6." The trucks will now represent GVWs from 15,000 pounds in Class 4 to 22,900 pounds in Class 6. Chevrolet hasn't offered a medium-duty chassis cab truck since 2009. This is a "Silverado on steroids," according to the automaker. The trucks will be powered by a standard Duramax 6.6L turbo-diesel engine, which is the only engine available on the Silverado, and mated to a choice of Allison transmissions. The trucks will achieve 350 hp at 700 lb.-ft. of torque. They will be offered in seven wheelbase options, two trims (WT and LT), and a Crew Cab and Regular Cab variant, providing a number of available configurations for vocational fleet needs. A few special features include tilt hood, which will make maintenance a breeze. Sometimes referred to as a "clamshell" design, the hood is hinged at the front. The truck's hood and fenders all tilt forward nearly 90 degrees, giving the operator or tech full access to the engine compartment. Another key exterior aspect is in the center bar in the truck's grille. The bow-tie is open, allowing even more airflow into the engine compartment, just like the Chevrolet Camaro Z28. "On this particular truck, we've looked for as much feedback as possible and done more canvassing of stakeholders within the industry than anything we've ever done," Peper said. "We believe it's going to be a smashing success." INDIANAPOLIS. Chevrolet revealed its Class 4 and 5 Silverado HD 4500/5500 chassis cab trucks today at the Work Truck Show — and then snuck in an unexpected 6500 Class 6 truck as well. 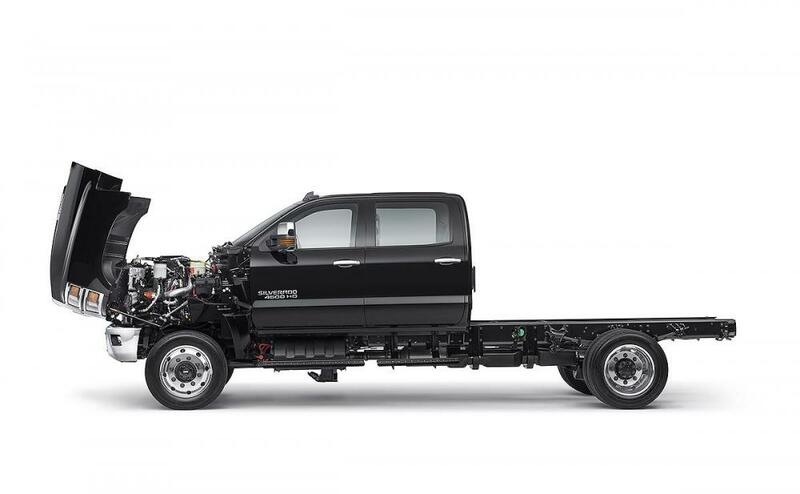 Calling it the "biggest news in years" for the brand's commercial lineup — "literally" — the automaker has added the larger conventional cab trucks to its offerings after promising they were in the works for some time. "It all adds up to a product lineup that is, by far, the best and the broadest that Chevrolet has ever had," said Ed Peper, U.S. vice president for GM Fleet. "You don't build a dominant franchise like this overnight." He explained how the OEM gathered extensive input from dealers and customers in designing the new trucks. "There's never been a Silverado that's not a workhorse," Peper contended. "The more choice we offer truck customers, the more we drive sales across our entire portfolio." Pointing to Chevrolet's low-cab forward trucks, which offer alternative medium-duty class vehicles, he said the OEM's customers had been asking for a medium-duty conventional cab offering "because they want a one-stop shop for all of their vehicle needs." "Good things come to those who wait," Peper said. "Once we made the decision to get back into the medium-duty conventional cab business, we were determined to do it better than anyone else." So Chevy gathered input from fleet managers, truck drivers, upfitters, technicians and dealers in developing the new Silverados. John Schwegman, director of commercial product and medium duty at GM Fleet, said the new trucks "are designed to solve the most common upfit and ownership challenges fleets have with many of today's medium duty trucks." The Silverado will be available in 2WD and 4WD configurations and will be powered by the OEM's 6.6L Duramax diesel engine rated at 350 hp/700 lbs.-ft. of torque. The trucks will have Allison automatic transmissions with a power take off option. — A factory-painted frame with one-piece frame rails; smooth, unobstructed top sections; and through-the-frame fuel fill lines. —Seven cab-to-axle options ranging from 60 to 162-in. along with five axle-to-back-of-frame lengths sized in 8-in. increments. —A lightweight, front-hinged "clamshell" hood that allows easier access to under-hood components combined with a 50-degree wheel cut. —A hood designed to optimize the driver's ability to see the road. —An available factory-installed rear air suspension; triple-sealed, inset doors that help reduce wind and road noise; and huck bolts used throughout the frame for superior clamping force. —A diesel exhaust fluid (DEF) tank located on the passenger side of the truck for more convenience. Connectivity options for the new HD Silverados include OnStar and Commercial Link, a built-in 4GLTE Wi-Fi hotspot (paid data plan required), wireless smartphone charging, Bluetooth and support for Apple CarPlay and Android Auto. 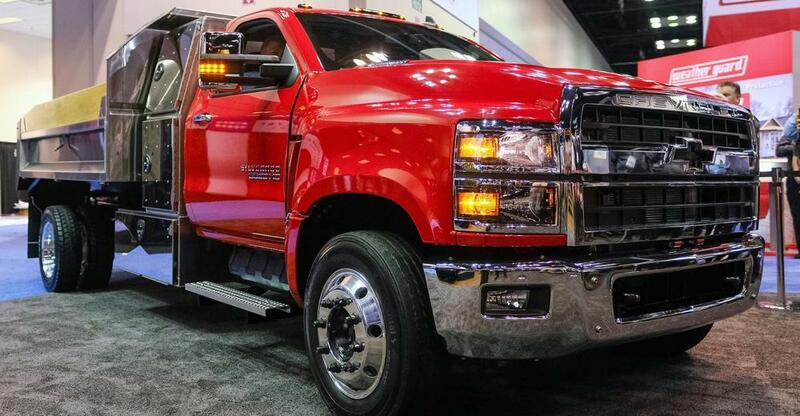 The new medium-duty Silverados are slated for production late this year. Chevrolet is building out its commercial-truck business with three new medium-duty Silverados, the first Class 4, 5, and 6 chassis cabs with the Silverado name. The 4500HD, 5500HD, and 6500HD broke cover at the Work Truck Show organized by the National Truck Equipment Association in Indianapolis this week. 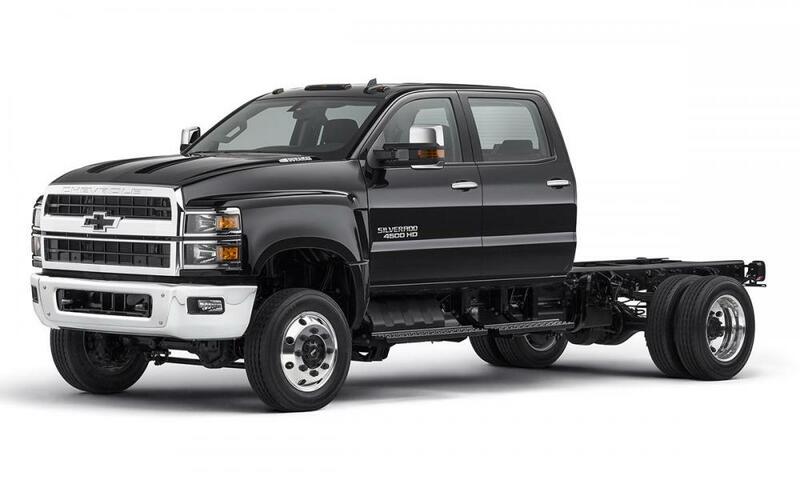 The chassis-cab trucks will offer Duramax diesel power, optional air springs, and straight one-piece frame rails, among other features intended to lure fleet buyers away from the competition. 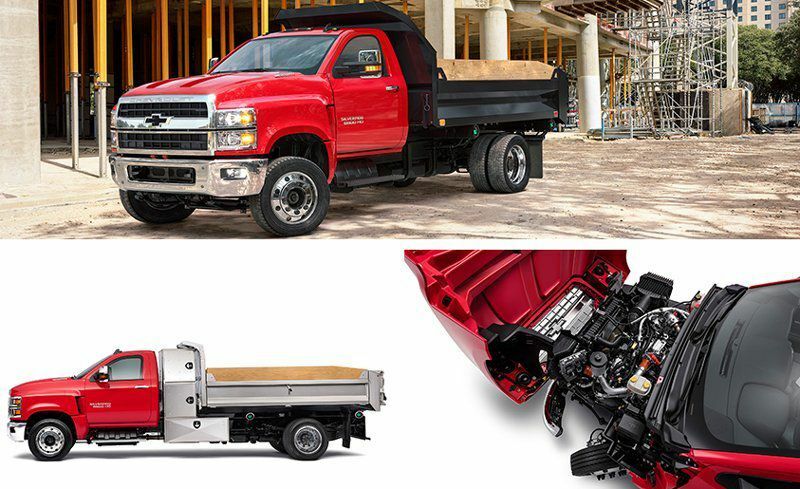 Expanding on its current heavy-duty-pickup lineup of the Silverado 2500HD and 3500HD, General Motors aims to match and overtake its rivals in the market for this type of chassis-cab unit. Chevrolet had previously announced it would be showing the 4500 and 5500 but surprised the crowd with the addition of the 6500. In contrast to the “heavy duty” pickups, these are “medium duty” in industry parlance, distinguishing them from the heavy Class 7 and 8 trucks that typically require a commercial driver’s license to operate—think box truck rather than semi. Chevy says its new Silverados will appeal to fleet operators by being more easily customizable than many competitors, and to drivers by offering a more refined driving experience. Both rear- and four-wheel drive will be offered on the new Silverados. All models get power from a 6.6-liter Duramax V-8 diesel engine that makes 350 horsepower and 700 lb-ft of torque, along with an Allison six-speed automatic transmission that has a power-takeoff option. The biggest selling point of the new trucks is their frame setup. Unlike some competitors, the new Silverado uses straight single-piece frame rails, which are painted at the factory to help fend off rust and have fuel lines routed within them for tidier packaging. Even rivets and brackets have been moved off the top of the rails to ensure a clean, smooth surface for upfitting configurations. Chevrolet will offer seven cab-to-axle-length options from 60 to 162 inches. It also has five lengths, in eight-inch increments, from the axle to the back of the frame. This wide variety should make it easier to couple multiple types of rear cargo setups without the need for additional supports or fitments. A second but equally important goal in developing these new Silverados was a comfortable driving experience. Chevrolet will offer factory-installed rear air springs, in addition to the beefy leaf springs, for a suppler ride, and the inset doors have been triple sealed to reduce noise in the cab. Additional feature points include a lightweight clamshell hood and front wheels that turn as much as 50 degrees to shrink the truck’s turning circle. These attributes also ease access for service. Modern amenities include an available 4G LTE WiFi hotspot, Apple CarPlay and Android Auto capability, inductive cellphone charging, and OnStar connectivty. Chevrolet intends to offer the trucks at more than 400 of its dealerships focused on the commercial market. Orders for the new trucks open this spring, and production will begin in late 2018. More details about payload, towing, and pricing will be available closer to launch. Here’s hoping that Chevy fits a conventional pickup bed to one, resurrecting the Kodiak nameplate, and that a GMC drops with Topkick on the tailgate.